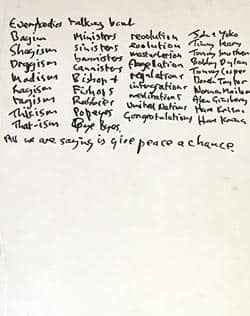 John Lennon's lyrics for Give Peace a Chance are to be auctioned at Christie's in London on 10 July. The lyrics were handed to Gail Renard, then 16, at Lennon and Yoko Ono's Montreal bed-in for peace in 1969. They are to be sold with other memorabilia, expected to fetch up to £300,000. Renard, then a Montreal student, sneaked into the Queen Elizabeth Hotel with a friend, knocked on the door and asked Lennon and Ono for an interview for their university magazine. She ended up spending the rest of the week with the couple and formed a life-long friendship. During the bed-in Lennon decided to record Give Peace A Chance, after which he gave the lyrics to Renard. He reportedly told her: "one day they will be worth something". The lyrics spent a number of years on a wall in Renard's study before being moved to a vault for safety. Have an album “give Peace a Chance” Plastic Ono Band autographed by both John and Yoko. Anyone have an idea the value? It would depend on various things – if it’s genuine, when it was signed, what sort of condition it’s in etc. I’m not aware of an album called Give Peace A Chance. What country is it from?